Arestelle’s outfit had evolved further by the time she entered the staggering mines of Moria with a couple of brand-new legendary weapons. 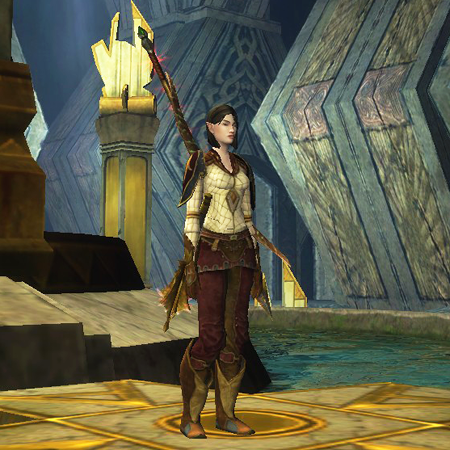 It still ‘feels’ much like the same outfit, between the shirt and the color scheme, but the chest armor is the only piece that didn’t change. She took the mask off, since Harvestmath was over, and I thought the back of the shirt looked too good to keep hiding it under a cloak. 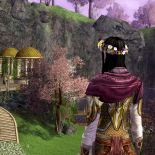 This entry was posted on 2014.03.20 by vyh in Outfits and tagged arestelle, burgundy, cosmetics, elendilmir, lord of the rings online, lotro, moria, outfits, sienna, white.